I was working on a reply to the latest outrageous Guardian editorial on the murder of four Jews in the French city of Toulouse,Toulouse shootings: in the line of fire, March 23, but was alerted to this reader comment which sums up the paper’s propaganda quite well. Also, for a bit of background, in addition to reading their latest take on the shooting (linked above), see my post regarding their Tuesday editorial, which (published prior to knowledge of the identity of the killer) named, as the broader societal culprit, “toxic” [anti-immigrant] rightwing rhetoric” in France, and, surmised that the shootings represented an attack on “minorities” motivated by such a reactionary political atmosphere. 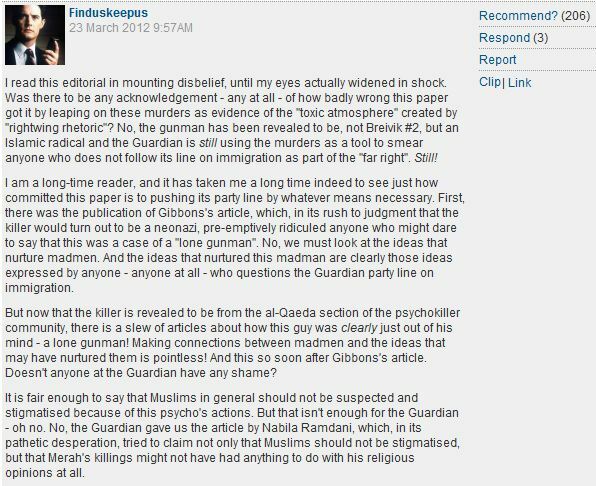 The possibility that the murderer was an Islamic extremist didn’t enter the Guardian author’s mind. 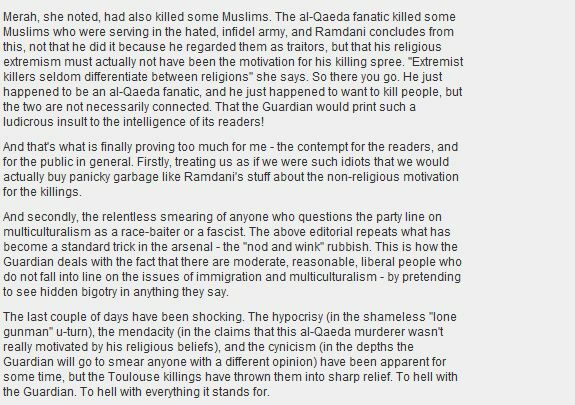 Today’s editorial (written after the radical Islamist motivation of the killer, Mohammed Merah was known) didn’t so much as acknowledge how horribly wrong their initial commentary was – all of which was too much for this Guardian reader, whose comment actually garnered 206 ‘Recommends’. By the way, as you can see by his commenter profile, he is (or was) indeed a Guardian reader – with comments at CiF dating back to Oct. of 2009. It’s nice to see that some of the paper’s readers can be properly shocked by Guardian editors’ hypocrisy, intolerance and ideological extremism. Blimey! What a tour de force! Congratulations that angry reader. In the off chance that the reader sees this post, please email us at: contactus@cifwatch.com. Adam, the link to the Guardian article isn’t working. Thanks. Guardian editors resemble the psychotic conquistador in Herzog’s film, Aguirre, the Wrath of God, who floats down the river on a raft with only gibbering monkeys (Guardian contributors) for company. … and oblivious too – or ignoring – the wake from the motor boat of the camera crew after they’ve just driven around him. I’m sure there’s some symbolism for interpretation there as well. Oh boy! The jig is up! More and more disturbing with every stupid opinions-as-facts article put out by the Groan in support of Islamism is their utter and complete lack of insight into how what these charmers write might be perceived by sensible, intelligent human beings who happen across their pages. For the reader above, it seems that the line in the sand has been crossed. Well done for speaking up and speaking out against these snivelling parasites and supporters of Islamist terror. However, and without meaning in the least to insult him/her, what on earth took him so long? The penny hopefully is beginning to drop Adam! Bravo to people like Finduskeepus. Its a cold douche after a heatwave of so much morally corrupt depraved thinking and lies. I noticed this very impressive post earlier. As another poster said: THEY should be on the G. payroll rather certain other idiots. Oh wow!! What a terrific post by finduskeepus, all the more impressive because he’s so obviously a decent independently-minded liberal who has reached the end of his tether. If the Guardian editorial team had any intelligence they would see they are losing just the sort of readers that used to form their circulation backbone. Reading this post by finduskeepus makes me appreciate just how hollow and intellectually bankrupt are the likes of Berchmans and his fans. Perhaps thats why the groan has started advertising on tv in a vain attempt to get more readers. The advertising line is read the Guardian for, ‘the whole story’. Apparently finduskeepus doesn’t agree and there are probably many more like him who are fed up with being treated as idiots. Finduskeepus wasn’t alone in expressing anger at the Guardian’s hypocrisy. Right from the start, other commenters drew attention to the cynical about-face from ” nasty right-wing French society being the real culprit to the “lone gunman” ploy when it was revealed that the killer was a young fanatical Muslim. I would say that the vast majority of commenters were disgusted with the Guardian, especially as no apology or regret was offered. Will this fiasco bring changes to Guardian policy? Not with the current editorial staff. The Guardian instead of retracting their perverted articles that are on the nose,they just keep marching and staggering blindly into another disaster…. Author of the Guardian comment Findus keepus has an amazing resemblance to Anthony Julius . Reading some of Berchmans posts,the guy really thinks that he is the Guardian of the Guardian. If this is what the Guardian has come down to.That it needs the likes of Berchmans to come to it’s rescue. Berchmans I know that you can’t help yourself and that you pop in here to see what’s written about you. The problem with Guardian editors and contributors, and it does appear to be insurmontable and non-negotiable, is that these people genuinely and fervently (enthusiastically even, and this is a major part of the problem) believe themselves to be on the side of the good. Whereas others such as Finduskeepus would harbour reservations about where the good is to be found. It is perhaps not too strong a viewpoint that at the very least those writing for the Guardian are accesories to evil and should accordingly be treated with disdain, disgust and aversion. typos are always laughable – accessories. The Guardian is now crawling with morons, right-wing extremists, such as this lot who have commented above. It has sold out to American propaganda and is home to insulting, bigoted, creationist, anti-immigrant, anti-Muslim, red-neck ignoramuses. A trash-can of morons, writing idiotic American-interest junk for the brain-dead. The Guardian has lost European readership – it’s now a place only for dumbed-down mediocrities. Berchmans – well done – pay no attention to these insulting morons.